We researched 10 portable oxygen concentrator companies based on ratings from consumer reviews and independent companies, as well as price, features, warranty and battery life. Inogen makes compact, lightweight portable oxygen concentrators designed for active lifestyles and outdoor use. Each POC comes with a lifetime warranty. Inogen POCs range in price from $2,295 to $3,465. Known for its healthcare and medical equipment, Philips makes portable oxygen concentrators and other respiratory-related medical equipment under the name Philips Respironics. Its portable oxygen concentrators come in two models with anywhere from 5 to 11 pulse flow settings. Philips POCS cost between $2,495 to $3,295. CAIRE, Inc. is an Accreditation Commission for Health Care (ACHC) qualified and accredited company. It is the largest manufacturer of oxygen therapy systems on the market, bringing high-level technology to those suffering from COPD, asthma and other respiratory ailments. Its POCs range in price from $1,500 to $3,200. ResMed is known for its oxygen therapy products and makes and sells the Mobi™ portable oxygen concentrator. The Mobi™ comes with an intuitive display, pulse-wave technology and one of the longest lasting batteries on the market. Pricing for the Mobi™ is around $2,295. Invacare is known for its medical products including its portable oxygen concentrator: The Platinum Mobil. Weighing in at under five pounds, the Platinum Mobile has a battery life of up to five hours and recharges in as little as two hours and twenty minutes. The Platinum Mobile is priced at $2,195. Pure Medical sells medical equipment and supplies including portable oxygen concentrators from industry-leading brands like Inogen and Philips Respironics. You can select and order a portable oxygen concentrator directly from the Pure Medical website. We selected the six best portable oxygen concentrators after evaluating and researching ten companies. We compared ratings from consumers and independent sources, as well as price, features, warranty and battery life. The portable oxygen concentrator companies that stood out to us are Inogen, Pure Medical, CAIRE Inc., Philips Respironics, ResMed and Invacare. In this guide, we will discuss the types of portable oxygen concentrators, share tips for choosing one to fit your needs, and we’ll share our detailed evaluations of the top companies. Read our helpful frequently asked questions about portable oxygen concentrators later in this guide as well. Purchase extra batteries if it’s affordable so your time away from home isn’t limited by battery life. Portable Oxygen Concentrators: Continuous or Intermittent Flow? Intermittent flow concentrators are called pulse flow because these concentrators can be set to adjust the rise time, or how quickly or slowly the pulse oxygen is delivered to synchronize with your breathing cycle. Intermittent flow devices only provide oxygen during inhalation, producing nothing during exhalation, thus not wasting oxygen. Continuous flow concentrators deliver oxygen continuously in liters per minute. When determining which type of portable oxygen concentrator you need, keep in mind the COPD Foundation says for most patients, intermittent flow devices can fully meet the supplemental oxygen needs. Your doctor prescribes a flow amount based on what he or she feels is appropriate for your condition. Portable oxygen concentrators are costly and for some, buying a POC is financially impossible. Renting your equipment under Medicare Part B as durable medical equipment (DME) can be an excellent money-saving option. Ask your doctor about where you can rent a portable oxygen concentrator. According to Medicare.gov, you’ll rent supplies for the first three years at 20 percent of the cost plus any remaining Part B deductible in most cases. After the initial 36 months, your supplier must continue to provide maintenance and service for up to five years at no additional charge as long as you need oxygen therapy. After five years, you can stay with your existing supplier or select a new one and the 36-month rental period starts over. Portable oxygen concentrators are easily moved around the home or are lightweight, wearable devices you can carry with you as you walk, shop, travel or go to appointments. A portable air concentrator designed for home use is a unit either on wheels or a cart that weighs under 20 pounds. Wearable concentrators can weigh less than five pounds, and you can carry them in a small bag or backpack. Most wearable portable oxygen concentrators run on AC or DC power and rechargeable batteries so they can be used at home or on the go. The downside is that the wearable devices are considerably more expensive than their larger, heavier counterparts. Dealing with one of these diagnoses and subsequent required lifestyle changes is difficult enough without wading through a sea of information from one POC company after another, so we did that work for you. Our in-depth portable oxygen concentrator company analysis included researching 10 of the most common POC companies. Then we narrowed that list based on specific criteria surrounding equipment features, cost, warranties and more. 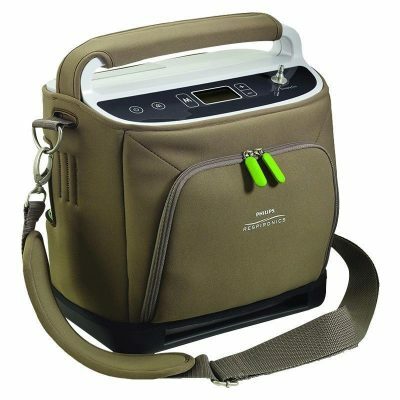 The result is our list of the top six portable oxygen concentrator companies. In 2001, Inogen CFO Alison Bauerlein’s grandmother was diagnosed with COPD and prescribed oxygen therapy. While the products available at the time allowed her grandmother to breathe, this was not without the hassle of dragging a heavy oxygen tank around. Bauerlein, then a University of California student, wanted to return greater freedom and independence to her grandmother. She and two other students, Brenton Taylor and Byron Myers, developed a prize-winning business plan that became Inogen, a medical technology company dedicated to improving the lives of those who rely on portable oxygen concentrators. Inogen provides compact, lightweight, portable oxygen concentrators designed for an active lifestyle, with a rare lifetime warranty. You can buy either of these two wearable POCs alone and get a three-year warranty. However, if you purchase an Inogen One G3 or G4 system in one of three Freedom Packages, you will get a lifetime warranty and extra batteries. Inogen is an ACHC accredited company for oxygen therapy and holds an “A+” rating with the Better Business Bureau. Its portable oxygen concentrators have won awards for design in Medical Design and Excellence categories. For more information about an Inogen’s portable oxygen concentrator, visit Inogen’s website, or call 888-233-9536. You can also read our comprehensive Inogen review for more details about Inogen portable oxygen concentrators. The Accreditation Commission for Health Care (ACHC) qualified and accredited CAIRE Inc. for complying with a comprehensive set of standards that demonstrate a higher level of performance and patient care. Over the past decade, CAIRE has become the largest manufacturer of oxygen therapy systems on the market. The company provides oxygen to high altitude clinics on Mount Everest, military personnel and space exploration laboratories. CAIRE Inc. brings high-level technology and innovation to seniors who suffer from COPD, asthma and other respiratory ailments. With four oxygen concentrators available (3 portable), CAIRE has you covered wherever you go. All CAIRE portable oxygen concentrators come with a limited warranty and a variety of optional accessories. In addition to the portable oxygen concentrators listed below, CAIRE also manufactures the Companion 5 wheeled continuous flow model for $800. At 36 pounds and with no battery options, the Companion 5 is suitable only for in-home use. For pricing information or to start a purchase, call (877) 443-8603 or get started with shopping online. Read our detailed CAIRE, Inc. review for an in-depth look at all of CAIRE’s portable oxygen concentrators. Philips researches and manufactures healthcare equipment spanning from MRI and other digital imaging equipment to the latest in personal healthcare technology with innovative solutions like Philips Lifeline, sleep apnea respirators and portable oxygen concentrators. One of the Philips company’s top goals is to provide innovation while keeping costs down. Philips has sales and service departments in over 100 countries with annual revenues of $20.1 billion and has a line of both stationary and portable oxygen concentrators. 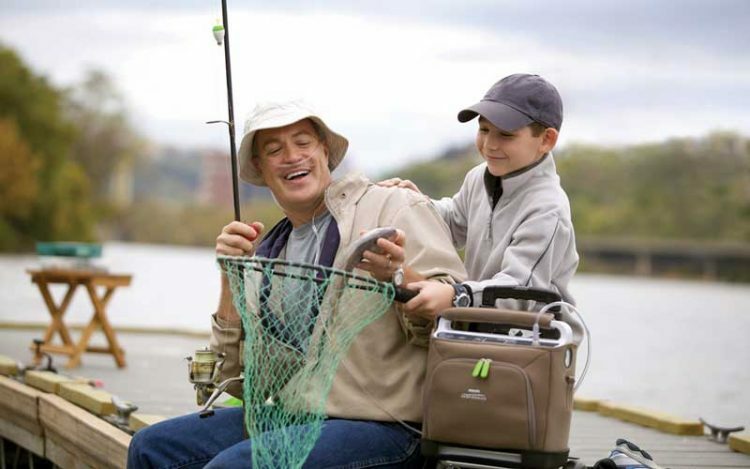 The Philips Respironics SimplyGo line of POCs includes the only portable oxygen concentrator to feature both continuous flow and pulse-dose delivery in a single device weighing only 10 pounds. Depending on the model, five to 11 different pulse dose settings help keep you active regardless of your oxygen needs. Aside from Philips SimpyGo POCs, the company also manufactures the SimplyFlo model, the smallest and lightest stationary oxygen concentrator currently on the market. The SimplyFlo weighs in at under nine pounds and is best for those who need oxygen while they sleep. The parent company, Philips is not BBB accredited but holds an “A+” rating. For pricing information or to start a purchase, call (877) 751-0746 or get started with shopping online. For more details about the SimplyGo and SimplyGo Mini POCs, check out our full Philips Respironics review. Readers of this portable oxygen concentrator guide also found these related articles helpful. For many, supplemental oxygen is a necessity but some might not be able to afford it. Read about the different ways you can pay for a portable oxygen concentrator. Read about the rules and regulations involved in traveling with your portable oxygen concentrator. Keeping the parts and components of your portable oxygen concentrator clean is important to prolong the life of the device and keep you healthy. How does a portable oxygen concentrator work? The air we inhale usually is 80 percent nitrogen and 20 percent oxygen. A portable oxygen concentrator pulls air in, then concentrates and purifies the oxygen level to deliver 90 to 95 percent pure oxygen and five to 10 percent nitrogen. What is the difference between stationary and portable oxygen concentrators? Stationary oxygen concentrators are continuous flow oxygen therapy devices, typically with a large tank. With a stationary oxygen concentrator, you can go about your usual activities at home while using tubing extensions attached to the oxygen tank often as long at 50 feet. Stationary oxygen concentrators are useful while sleeping and the oxygen flow is from one to five flowmeters per minute. Stationary devices are no longer as cumbersome as they once were, with today’s oxygen concentrators being much quieter and no longer requiring the once-customary 50-pound tank. However, SOCs need power from an electrical outlet, restricting use to around the house. In contrast, the average weight of a portable oxygen concentrator is five pounds and can be as light as around three pounds. POCs can operate on a battery and are worn or carried by the person using the device. These characteristics make a portable oxygen concentrator easy to manage while you are out of the house. Do I need a prescription to buy or rent a portable oxygen concentrator? Yes. Any supplemental oxygen is considered a medical treatment. If you need an oxygen concentrator, your doctor may prescribe a specific oxygen flow rate and the length of time you should use the oxygen each day. Does medical insurance cover a portable oxygen concentrator? Most insurance companies cover portable oxygen concentrators as durable medical equipment prescribed by a physician. You need to verify coverage with your insurance provider. Can I take my portable oxygen concentrator on an airplane? Yes. Since 2009, the Department of Transportation final rule, Nondiscrimination on the Basis of Disability in Air Travel, requires air carriers with passenger service to allow passengers with a disability to use an FAA-approved portable oxygen concentrator on flights. There are currently 23 FAA-approved POCs, including all of the wearable models featured in this guide. Are there any other considerations I should keep in mind when comparing portable oxygen concentrator companies and products? Always be sure you understand the company’s return policy and if it includes any restocking fees. Also, check to see how the portable oxygen concentrator company handles service on the machine. Ask if they provide a free loaner POC to use while their technicians service your device. Last, be sure to read the warranty in its entirety so you won’t be caught off guard should you have any issues with your POC. Discuss portable oxygen concentrators with your health care provider before you buy for help with deciding on the features you need so you can remain independent. Regardless of which portable oxygen concentrator company you decide to go with, select your POC carefully after determining your needs and considering your desired lifestyle. No one portable oxygen concentrator is best for everyone; each has pros and cons, but CAIRE, Inogen and Philips all offer high-quality, dependable products.